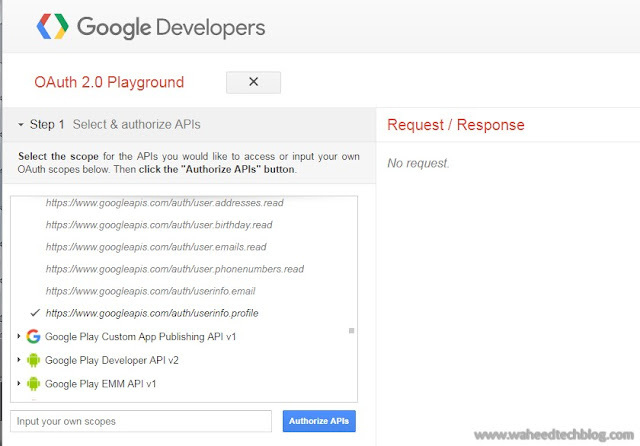 Tech Blog: Access User Profile API via Google OAuth 2.0 Playground ? 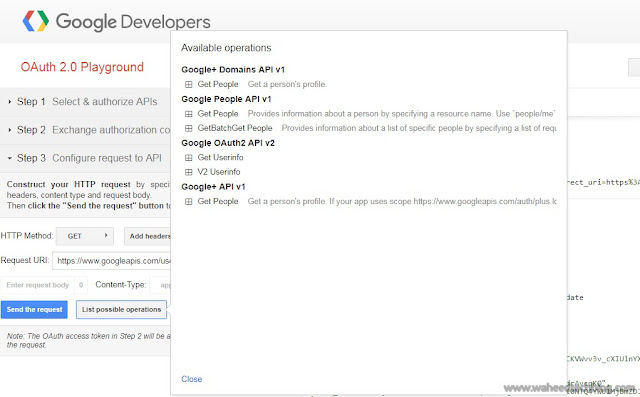 Access User Profile API via Google OAuth 2.0 Playground ? The OAuth Playground is an application/tool by Google for learning how OAuth works. It presents you with a three-step process for selecting the services you want to authorize, generating an access token, and making API requests. In OAuth terminologies, Google OAuth playground will act as a client Application which does contain client id, Client secret and OAuth Endpoints required to access Service provider. It also supports custom endpoints as well i.e. using Google OAuth playground you can connect to another service provider as well apart from Google like Salesforce. In this blog, I’ll only focus on Google API and will try to retrieve user profile via playground. Step 2: You will see a list of scope using which you can access particular resources. 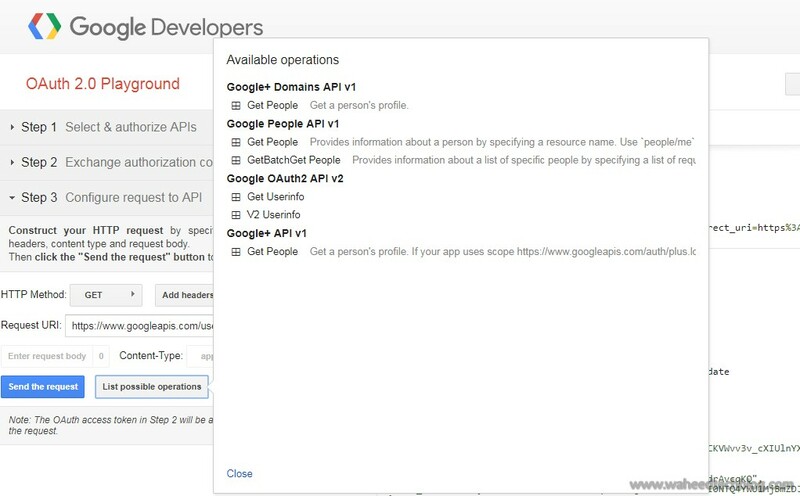 As our aim is to fetch user profile so will scroll down and select https://www.googleapis.com/auth/userinfo.profile from Google People API v1 scope. Step 3: Click on Authorize APIs button and If you are not logged into google then it will ask for your user credentials and after successful authentication, it will show the authorization consent page. Click on Accept button. redirect_uri -> URI registered on the authorization server as a RedirectURI or callback URL. and after successful authentication and authorization, Playground is getting the Authorization Code on its registered redirect URL. It contains the Auth code in exchange of which we will get the access token. Step 5: To get the access token, Click on Exchange authorization code for tokens button and you will get the access and refresh token. Check Request/Response section, Playground hits TOKEN ENDPOINTS to get the access token. We hit token endpoint to obtain an access token by exchanging the Auth code. Code -> The Authorization code received by the Authorization server. The token response contains an access token along with other information in a JSON format. access_token -> token using which you can access the user details from resource server. expire_in -> number of seconds after which the access token get expired. refresh_token -> using refresh token, we can get new access token once the above access token is no longer valid. Step 6: Select V2 UserInfo from list possible operations to get the user profile. Step 7: Click on Send the request button and it will access the user profile by passing access token as authorization bearer in the headers and display it in JSON format. Conclusion: Google playground is an amazing tool to learn OAuth flow with Google as well as with custom application. 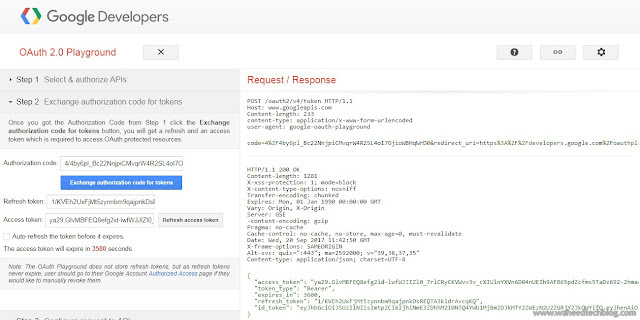 If you are planning to build your Authorization server then you can use it as a testing tool as Google playground is a standard OAuth Client web application. If you need an idea on how can we get it done the same thing via JAVA web application then you must check my blog over here. I have done something similar where my Service provider is Salesforce instead of Google.